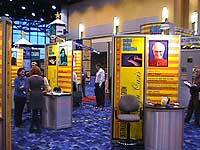 The International Housewares Show was filled almost the entire McCormick Place in Chicago from January 10-13, 1999. Although this isn't the typical technology tradeshow I cover, it was a unique visually and gastronomically appealing show. 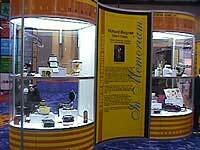 This article describes some of those interesting items I found on display at this trade show. One of the most visually unique displays I saw at this show was at the Majestic booth. This show covered so many different categories - kitchen tools, bakeware, electric appliances, tabletop items, home space organizers, cleaning and "stick" (brooms, mops, etc.) products, seasonal merchandise, pet supplies, outdoor products, lighting, furniture, decorative home accessories and food service products. Yes, all in one show. This show filled McCormick Place, the new South building, the North building including the lower level and Lakeside Center. 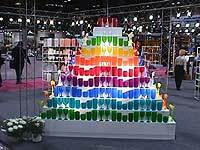 I was overwhelmed by the large assortment of products at the show. Recently Steve Jones, another editor at Reviews OnLine, told me about an iron that looked remarkably like Apple Computer's new iMac. 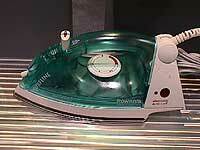 Well, here is that iron from Rowenta. 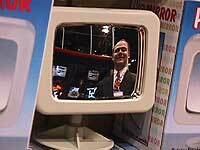 It has been shipping since 1991, nearly SEVEN years before the iMac ever shipped. 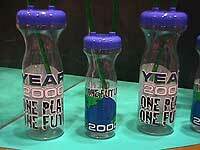 At this show, they had a different slant on the Y2K issue. 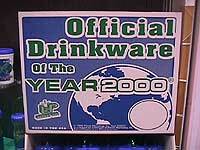 Instead of worrying about how many more Klocs ( K [thousands] Of Lines of Code) of COBOL to process before 1999 is over, Betras Plastics had some interesting drinkware ready for your Y2K party! Many computer pundits talk about the "network-enabled" toaster of the future, which I didn't find at the show, but did find this toaster from Sharp, which can toast a "dinosaur" on the bread and it featured a cancel key. 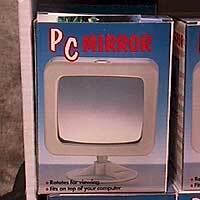 Here's a useful corporate product for anyone in a cubicle or office. This device will help keep you informed about who is "sneaking" up behind you or is in your doorway. 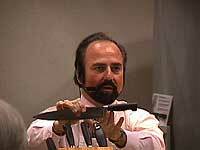 Pictured is Drew Prinz, Marketing Manager of Kingsbridge International, distributors of this product. 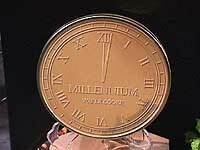 The Millennium is becoming a new product category, both for Y2K and 2001 (viewed by some as the "real" start of the millennium). One of the novel features of high tech appliances is their attention to DESIGN. Unlike PC devices in a beige box, appliances combine style with functionality. 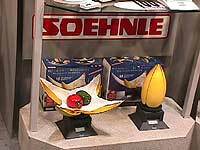 This scale from Soehnle looks like a closed yellow flower when not in use. Its "petals" open to reveal a mesh "net" that holds the item to be weighed. This is really cool product - and believe it or not, the entire unit is dishwasher safe! 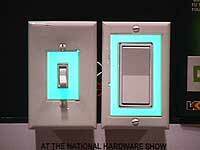 If you haven't completely rewired your house and installed computer controlled X10 light switches, LK Manufacturing has created these novel light switches, which also double as night lights and fit in a conventional electrical box. Why didn't anybody think of this sooner? They look much cooler than the conventional, "orange glow", toggle switches. 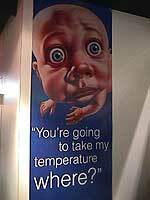 This poster was the most humorous one I have seen in a long time - the expression on that face is priceless. Celebrities were all over the show. 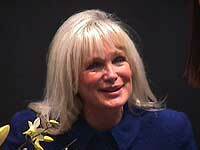 Linda was signing autographs in the Salton booth. Salton is a Midwestern company, located in Mt. Prospect, Illinois. Katerina signing autographs at the event. 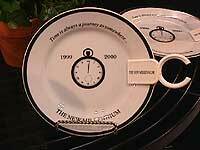 Martin Yan, host of PBS "Yan Can Cook"
At a Comdex show, "Storage Solutions" had a considerably different meaning and is measured in megabytes and gigabytes. 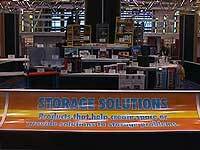 At the Housewares Show, these products help provide storage for your home and are measured in inches and feet. Part of the Design Oasis, which displayed some very cool, classic housewares from the thirties through fifties. Displayed is part of the Richard Bugner Industrial Design collection, which contained unique appliances and housewares from the past. Each item had classic lines and they really worked! I was envious. Having your own kitchen of pre-sixties appliances is probably the closest thing we have to time travel. In keeping with the innovative products, the National Housewares Manufacturers Association sponsored a Product Design competition amongst college students. 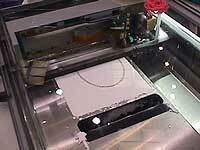 New technology is being used to create new appliances. This is a plotter that can create three dimensional prototypes. Copyright © 1999 Rick Smith and Bill Smith All rights reserved.